Originally built for white railroad passengers in 1920, the 16-room Windsor Lorraine Hotel was built on the northern side of this site. Local African American Walter Bailey purchased the hotel in 1945, renamed it for his wife Loree, and expanded it to include the second floor. The Lorraine ultimately became an African American establishment during the days of segregation, catering to music legends such as Cab Calloway, Count Basie, Ray Charles, Lionel Hampton, Nat King Cole, Otis Redding, The Staple Singers and Aretha Franklin. 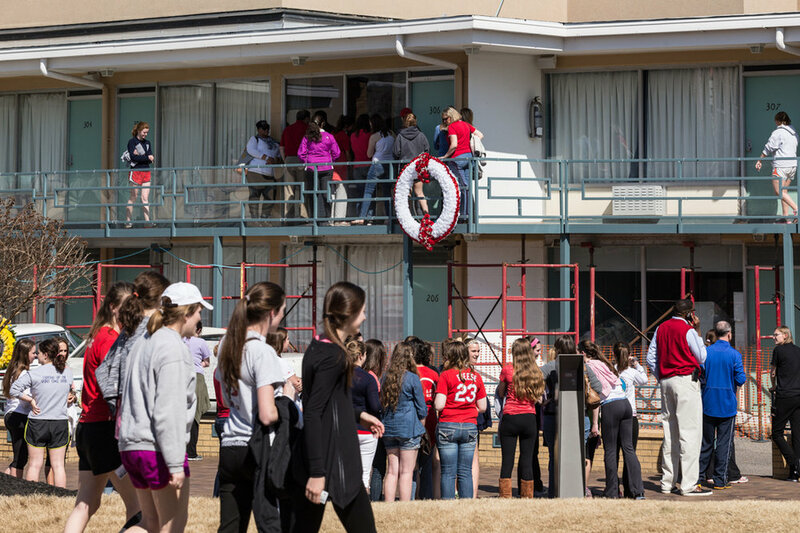 While in Memphis for the 1968 Sanitation Workers Strike, Dr. Martin Luther King was fatally shot on the balcony outside room 306 at the Lorraine. The wreath marks the place where Dr. King drew his last breath. Bailey's wife Loree suffered a stroke just hours after the assassination and died 5 days later. The National Civil Rights Museum officially opened in 1991, and expanded the museum in 2002 to include the Young and Morrow building and Founders' Park in front of the Museum. Today the museum is completing a $25 million renovation and expansion project.